Former Charlottesville City Council candidate and Public Housing Advocate Brandon Collins is energetic and passionate, but he is rarely described as optimistic or even jubilant. 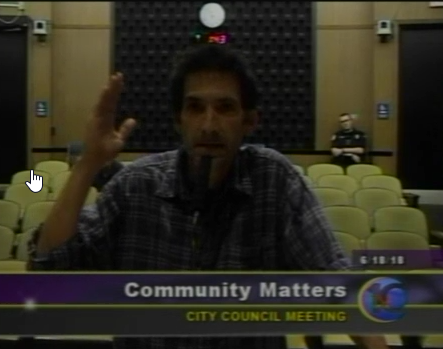 Late in Monday night’s (6/18) City Council meeting he was both as he called for Charlottesville to give up on developer incentives that produce precious few affordable housing units and instead launch a “Marshall Plan” for affordable housing to meet the current shortfall of 3,318 units. • The city’s constrained supply of developable land supply limits the potential for new residential construction. • More than 200 year-round housing units have been diverted to short-term transient rentals through Airbnb and other leasing services. • High land and development costs limit the market’s ability to build new units that could rent at levels affordable to households at less than 60 to 80 percent of AMI. • Federal funding for construction of new affordable housing and for Housing Choice Vouchers has not kept pace with the growing need. Public housing funding to the Charlottesville Redevelopment and Housing Authority includes almost no support for renovating existing public housing. • Zoning policies such as minimum lot sizes, height restrictions, setback requirements and maximum residential densities can prevent more intensive development of the city’s limited land resources. Community resistance to change leads to policies that prioritize preserving existing single-family neighborhoods over the development of new affordable housing. • The lack of predictability in the City’s development approval process has a chilling effect on developers considering projects that require City Council and Planning Commission approval. A last-minute decision can scuttle or significantly delay projects in which the developer has proceeded in good faith, investing hundreds of thousands of dollars. • The approval process is expensive and time-consuming, adding directly to the total development costs and ultimate housing prices. • The tight housing market allows landlords to discriminate against low-income households with limited financial resources, spotty or no credit histories, arrest records, children, housing choice vouchers or other perceived risk factors. • Housing affordability for many households is an income problem. Low levels of education, limited skills training, inadequate public transit and difficulty finding quality affordable child care can prevent individuals ability to reach financial self-sufficiency. With this report in hand, the folks at Partners for Economic Solutions examined the height bonuses currently under consideration in both the Strategic Investment Area and the Comprehensive Plan. 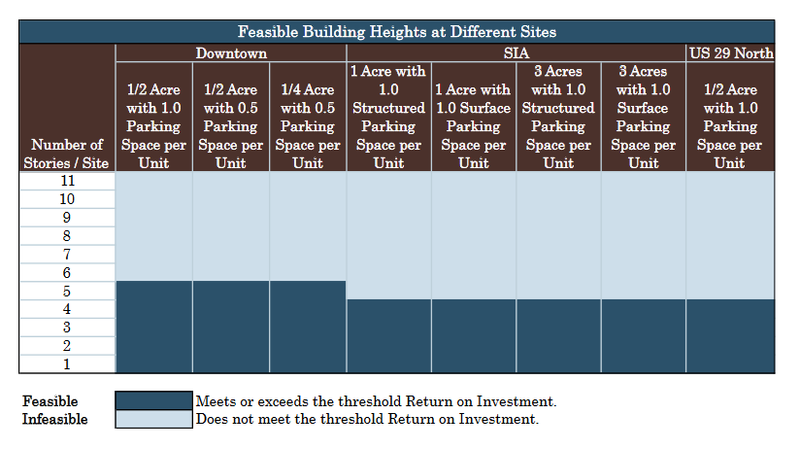 The concept explored was how many units could be provided and at what level of affordability. The very detailed report included carrying costs, a 7% profit margin as well as other development costs. This profit margin was explained as necessary or the project would not gain investors – they would instead put their money into other projects with a better return on investment. Development costs are impacted by several factors, but most significant are the style of construction and the type of parking. Height has a direct impact on costs with lower-cost wood-frame construction limited to four stories. A fifth story can be added if the first floor is constructed in concrete rather than wood. Above five stories, most apartment buildings are constructed on concrete or steel and concrete at a much higher cost per square foot. Parking is a major cost factor, averaging $5,000 per surface space, $20,000 per space in an above-ground parking structure and $32,000 per space in a below-ground structure. Surface parking is the least expensive option, by far, but it consumes a great deal of land. The model assumed up to four stories of development would be served by surface parking with taller buildings requiring structured parking. The analysis also suggests a limited ability for height bonuses to secure committed affordable housing units. Generally speaking, Charlottesville rents do not support the construction of mid-to high-rise residential buildings with the exception of student housing adjacent to the University of Virginia grounds, high-end condominiums and possible niche products such as luxury senior housing. Five-story structures are feasible only at the higher rents achievable in Downtown neighborhoods. In conclusion, the report found that if density is the only incentive, based on market conditions, it does not work. Providing perhaps 15% of the incremental increase in units @ 60% AMI or 10% of the incremental increase @ 50% AMI. The consultant went so far as to say, “some of the Planning Commission concepts have no value to the developer; it is NOT an incentive”. Mayor Nikuyah Walker said, “This is bad”, and continued to express concern that the economic analysis included a profit margin for the developer. She contended that until we change that conversation we are never going to fix this. She said that if you are willing to house just a few people at a time – that’s not a direction I support. Councilor Mike Signer called out Albemarle County’s role in the housing affordability issue. He indicated the politics of increasing density is very tough highlighting his affirmative vote in the 3-2 decision to rezone 10th and Jefferson. He also pushed back on the contention that a profit margin did not matter. Vice Mayor Heather Hill called out the Air BnB taking up some of the Accessory Dwelling Units are being pulled out of affordable housing stock. At the end of the meeting, Collins presented a different perspective on the reports. He admonished City Council to think big. If they are really serious about fixing the housing affordability issue, they should stop depending on developers; they should do it themselves with their existing Charlottesville Redevelopment and Housing Authority. Collins’ “Marshall Plan” might include $140 million dollar bond issuance dedicated simply to the creation of new affordable units that will stay perpetually affordable. When pressed by Councilor Wes Bellamy how the city might pay for that debt service, Collins admitted he had not figured that out yet but thought it could be resolved. Beyond the ironic title “Marshall Plan”, the Free Enterprise Forum has several questions. If providing significant affordable units was not economically feasible with a 7% profit margin does the loss of that 7% make the economics work? Considering the current political climate in Charlottesville, could a $140 million bond be supported by the citizens? Would this council support the tax increases needed to service the debt issuance? Does addressing Affordable Housing head on start to address some of the other socioeconomic challenges in the City? Could this program actually increase the demand for affordable housing? As usual, we have more questions than answers. Stay tuned. Next Does ‘Social Justice’ Fit in Charlottesville’s Comprehensive Plan? Bravo Neil! This is great information to have. Thank you for doing good work!